Developed by the team at MIMS, MIMS Gateway unites all essential resource under the one platform allowing for ease of searching and discovering related information from a variety of sources. Extensive research with hospital staff, GPs and pharmacists revealed that a paucity of information was not an issue, it was the ability to find all relevant resources to support clinical decision making. 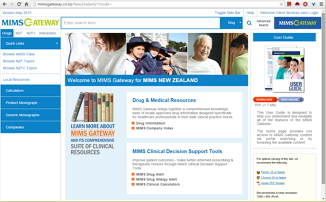 MIMS Gateway uses the familiar, MIMS platform as its foundation and builds upon this by including content from complimentary resources such as the NZ Formulary and other national resources. The site also contains information useful to counsel patients and clients such as patient medicine information leaflets and everybody disease information sheets. A key value of MIMS Gateway is the ability to associate medicine concepts with locally developed content – so that it can be easily found and used by staff. Not only does this save time but it also promotes usage of the resources which allows clinicians and users to be better informed of local policies and guidelines as well as safety alerts. MIMS Gateway is now available to NZ healthcare institutions and MIMS Integrated subscribers as part of the MIMS subscription package.